Somewhere in the middle here was a softcover Tuttle edition with a hot pink cover. Perhaps someone who owns this edition will email me a scan of the cover? So that's the publishing information. The publisher's forward is different from my original English edition to the latest Tuttle edition, but that's pretty much it as the 70's style fashions pictured within with attest. 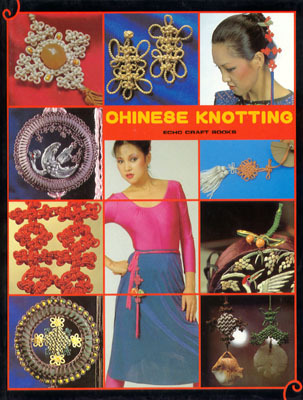 The book begins with some history of the craft (knot tying in an Asian context) and of the book (gathering information on a craft that at the time was rapidly disappearing). A modest gallery of the finished knotworks continues the introduction, but as the book is more an instruction book than a project book, it is not front-loaded with colour photos of the projects you'll find in the back. An overview of the knot tying process and materials finishes out the fore-matter before we dig into the knots themselves. 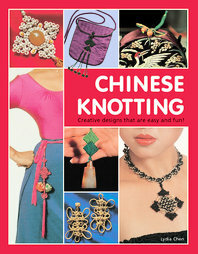 The list of knots in Chinese Knotting along with translation notes are found in the previous post. From double coin to flat are basic knots, the rest are compound knots. Ms. Chen sees the knots in a very architectural way or maybe I mean draughtsman-like. The knots are often presented in an exploded layout fashion and where possible the instructions are just a step by step revealing of this. Thus her instructions for the plafond knot has no flipping or inversion as others have. But where it is important, as in the case of the good luck knot, process steps are included. This style may not be to your liking. Certain knots are easier to learn from a process versus layout point of view, but no one can deny the wonderful and spectacular things her very precise minds-eye has created. In any case, that's why we have more than one book on the same topic, right? To add different perspectives when necessary for our own learning processes. The book ends with an interesting collection of small, generally personal fashion related, projects. Examples of these can be seen on the various editions of the cover. Forgot I was writing a "review" here. 8) This is an essential book for any collection of knot books (even if you're only into practical knots because, y'know, you need to expand your horizons. 8) It is also an essential work for anyone studying Chinese culture, Chinese art, or decorative arts in general.